Federal judge gives maximum sentence to Ponzi mastermind following his apology and victims' request for life sentence. 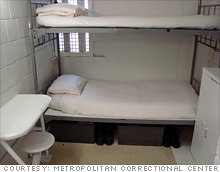 At the MCC, Bernard Madoff is getting a taste of life behind bars. Did Bernard Madoff receive a fair sentence? NEW YORK (CNNMoney.com) -- A federal judge sentenced Bernard Madoff, the convicted mastermind of the largest and most sweeping Ponzi scheme ever, to the maximum sentence of 150 years in federal court Monday. Judge Denny Chin of U.S. District Court in New York announced the sentence just moments after Madoff apologized to his victims. Chin, who called Madoff's crimes "extraordinarily evil," said the maximum sentence was important for deterrence, and also for the victims, many of whom erupted into applause after the judge announced the sentence. Many hugged and some of them broke down in tears. "The sentence imposed today recognizes the significance of Bernard Madoff's crimes," Lev Dassin, acting U.S. attorney, said in a written statement. The 150-year sentence is the maximum that federal prosecutors in New York requested, based on the number of Madoff's victims, the amount of money he stole and the extent of the damage he caused. Judge Chin said that the Federal Department of Probation had recommended a 50-year sentence. Shortly before receiving his sentence, Madoff offered an apology, which he delivered facing Judge Chin. "I live in a tormented state for all the pain and suffering I created," he said. "I left a legacy of shame. It is something I will live with for the rest of my life." Madoff said he was not asking for forgiveness and not offering any excuses for his behavior. "How can you excuse betraying thousands of investors?" he asked. "How can you excuse deceiving hundreds of employees? How can you excuse lying to and deceiving your wife who still stands by you?" Madoff then said, "I apologize to my victims. I will turn and face you." Addressing the victims in the courtroom directly, he offered, "I am sorry. I know it will not help you." Victims had urged the judge to dole out the stiffest punishment possible. "We implore you to give the maximum sentence at a maximum prison for this deplorable low life," said one of the victims in court before Madoff spoke. "This is a violent crime without a tangible weapon." Many of Madoff's investors were wiped out financially by the scam and sent letters to Judge Chin requesting he spend the rest of his life behind bars. Nine of the letter-writers spoke in court Monday. Speaking on behalf of his wife and looking at Madoff, the same victim said, "I have a marriage made in heaven. You have [a] marriage made in hell, and that's where you'll return. May God spare you no mercy." Through her attorney, Madoff's wife Ruth released a statement regarding her husband, "who stunned us all with his confession and is responsible for this terrible situation in which so many now find themselves." "I am embarrassed and ashamed," she said, in the prepared statement. "Like everyone else, I feel betrayed and confused. The man who committed this horrible fraud is not the man whom I have known for all these years." Madoff, who was stripped of his property in a legal action Friday, confessed on March 12 to running a massive Ponzi scheme. He pleaded guilty to 11 criminal counts, including fraud, money laundering, perjury, false filing with the Securities and Exchange Commission, and other crimes. Lawyer Ira Lee Sorkin, who represents Madoff, asked for a 12-year sentence. In a letter to the judge, Sorkin explained that his 71-year-old client "has an approximate life expectancy of 13 years" and isn't likely to outlive the requested sentence by more than a year. Madoff orchestrated the scam by masquerading his investment firm as a legitimate business. But the business became a front for a Ponzi scheme, in which the scammer uses fresh money from unsuspecting investors to make payments to more mature investors, creating the false appearance of legitimate returns. Madoff sent statements to victims claiming that their investments had grown several times over, but in actuality he had stolen, not invested, their money. Investigators believe that he had been running his scam since at least the 1980s, bilking thousands of investors until he finally ran out of money in December 2008. In a $170 billion legal judgment against Madoff Friday, the government announced it had seized all of his property in a deal that also forces his wife to give up homes and property worth millions. The value of all the assets will eventually be used to compensate -- or partially compensate -- victims, based on how much they invested in Madoff's firm. The Securities Investor Protection Corporation, an organization that shields investors in brokerage firms, will also pay up to $500,000 for any eligible claimant who lost money to Madoff, based on how much they put in. 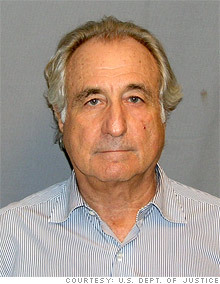 Thus far, federal investigators have identified 1,341 investors in Madoff's firm, who have losses exceeding $13 billion. They're still tallying the damage. Victims have until July 2 to file a claim with U.S. Bankruptcy Court in New York. Acting U.S. attorney Dassin said the investigation was continuing. "We are committed to bringing additional charges against anyone else who bears criminal responsibility," said Dassin, in a written statement. "At the same time, we are focused on tracing, restraining and liquidating assets to maximize recoveries for the victims." Since March, Madoff has been incarcerated in the Metropolitan Correctional Center in lower Manhattan, a holding facility for convicts awaiting sentencing. He will probably be transferred to a medium-security federal prison, according to prison consultants. Alan Ellis, attorney and author of the "Federal Prison Guidebook," believes that Madoff will probably get sent to Federal Correctional Institute Otisville or FCI Ray Brook, both in upstate New York, FCI Fairton in New Jersey or FCI McKean in Pennsylvania. --CNN's Allan Chernoff, Sara Lane, David Brandt, and Brian Vitagliano contributed to this report.